Daddy, grannie, and I went to go see Toy Story 3 on Sunday. I had heard a lot of high praise for this movie….two thumbs up….99% on the tomatometer. But Ebert and I don’t always see eye to eye on movies so I was a bit skeptical when I went in. It was a hot day when we set out to go to the movies, but I wasn’t going to let that take away from my anticipation. 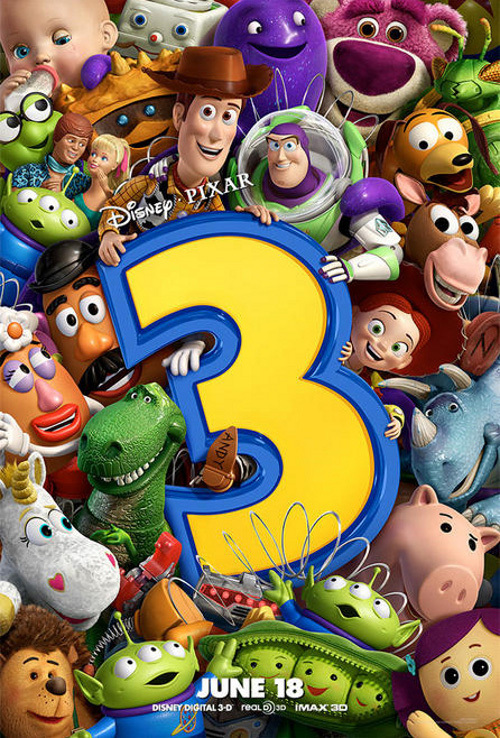 I was there to see Woody, Buzz, Ham, Rex, Jessie, and see what the new players like Lotso and Big Baby had to offer. **SPOILER ALERT** While his southern drawl was disarming, his color relaxing, and his scent of strawberries endearing, who would have guessed Lotso would have been such a great choice for a villain??? I mean, that came out of no where. I thought he was really there to welcome everyone to the daycare. WOW!! Can Disney flip a story or what?? ?And then, as if Disney didn’t do enough toying (get it? – I tell you, I have the wit of a 5 yer old) with our emotions, they had to throw in the whole theme of saying goodbye….the toys to their owner Andy, Andy’s mom to Andy as he went to college, and then Andy to his favorite toys. I’m pretty sure I saw my daddy’s eyes get watery. I guess he realized that kids get older real quick and someday I was going to be going to college and setting out in the world to make my own mark on the world. Maybe I should spare him and mommy that pain and just stay at home all my life let them support me….get back to you on that one. Anyway, all I can say is that this was the finest ensemble cast since Toy Story 2. With the theme of goodbye, I don’t see how they can make another movie, but Sean Connery has taught us to “never say never” – said in my best Scottish accent.